In May 2013, the state of Utah employed 9,920 certified nursing assistants, which means employment per 1000 jobs was 7.98. The figures of indeed.com show that, in January 2015, these professionals earned an average salary of $19,000 per annum. Sadly, this was 22 percent lower than the average CNA income on a national scale. Mean yearly nursing aide salary in Utah, according to the BLS, was $23,110 while the mean hourly pay was $11.11. 90% of CNAs made less than $29,060; 10% made more than $29,060. 75% of certified nurse assistants earned less than $25,080; remaining 25% earned more than $25,080. 50% received less than $22,580; rest 50% earned more than $22,580. 25% of CNAs were paid annual wages less than $20,570; 75% were paid more than $20,570. 10% of employees were salaried less than $18,710; 90% were salaried more than $18,710. According to the table below, the highest median annual, weekly, monthly and hourly salaries of certified nursing assistants, in January 2015, were $29,220, $2,435, $562 and $14 provided by Salt Lake City, Sandy, South Jordan and West Jordan respectively. Being the lowest paying city, Logan provided median annual salary of $24,348, median monthly pay of $2,029, and median weekly wages of $468. The median hourly salary in the state ranged from $12 to $14. The job title that a certified nursing assistant holds in the organizational hierarchy decides his/her salary. Individuals with higher designations receive hefty packages as compared to others holding entry-level positions. In January 2015, the highest paid professionals were CNA Hospice, who managed to earn an annual salary of $25,000. With an income of $23,000, CNA Rrmc and Medical Assistant Family Practice were the second top paid workers. Correctional Prison Facility CNA and Acute Care CNA were the lowest paid job titles with yearly earnings of $12,000. As per the prediction of the U.S. Bureau of Labor Statistics, the job growth of the nursing aides will increase by 21 percent from 2012 to 2022 on a national scale, more rapidly as compared to the average growth of all occupations in US. Besides, the ‘Utah Department of Workforce Services’ expect a massive increase of 37% for certified nursing assistants. The only drawback, which may result in the decline of these workers, is the dependence of nursing homes on government funding. Otherwise, there will be enormous job opportunities for CNAs in the impending years. Question 1 – I’m planning to move from Saint George to Ogden. 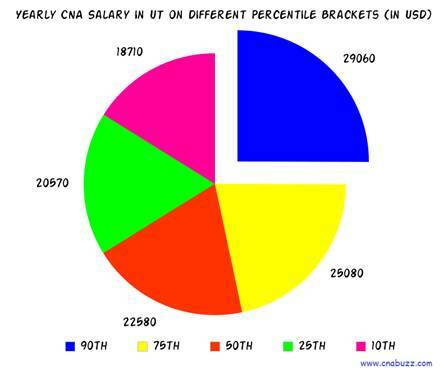 Is there any change in the hourly salary of a CNA? Answer – Yes. The hourly salary provided in the Ogden city is $14 while in Saint George, CNAs make $12 hourly. 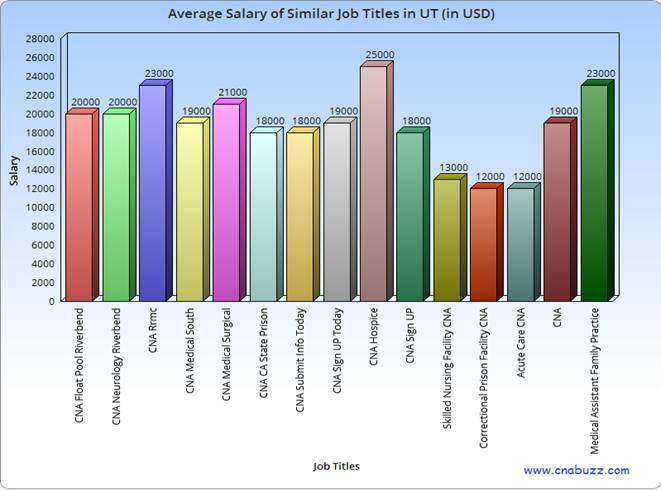 Question 2 – Can anyone suggest me some highest paying job titles and the salary offered to them in the state of Utah? Answer – In Utah, CNA Hospice is the highest paid job title with an average salary of $25,000. Other top paid job titles are Medical Assistant Family Practice ($23,000), CNA Rrmc ($23,000), and CNA Medical Surgical ($21,000).